With approximately 20% of babies, toddlers, and children affected by eczema, a skin condition also known as AD or atopic dermatitis, it’s no wonder there’s an overabundance of information out there. But even with the research studies, the data, baby eczema treatment, and diet recommendations, it’s hard for a parent – especially a new parent – to know what to do. Many children outgrow their eczema issues; some need to manage it as adults. But the right skin regimen and baby eczema treatment can give your baby a foundation of protection for years to come. Read on for information about what causes eczema in babies, how to prevent eczema in babies, and how to treat baby eczema. Eczema’s clinical name is Atopic Dermatitis and it affects upwards of 20% of the United States population. It is essentially sensitive skin that is dry, itchy and rashy. Eczema usually shows up in the first 1-5 years of a child’s life. You’ll rarely see it at birth, but a baby can show signs as early as six weeks old. The face and outer parts of the arms and legs are common places for rashes to appear. Scalp, feet, and hands are other areas sometimes affected. The eczema rash itself can vary from child to child, but it usually is an uncomfortable-looking patch of dry, rough, sometimes scaly or red, irritated skin. The biggest telltale sign for you as a parent? Other rashes will eventually go away, but eczema is stubborn and will keep coming back. Eczema is hereditary, usually connecting back to a parent or family member who has eczema or even hay fever or asthma. Before you beat yourself up; however, know that the line is dotted — a child can have eczema and be the only one in the family. From 2 years old to 10-12 years old, the flexural areas like the antecubital (elbows) and popliteal (knees) are affected. From youth to adulthood, eczema can appear as small round spots randomly on the body called nummular eczema to the focal eyelid or hand eczema. While not curable, eczema is controllable. Natural remedies for eczema, especially during summer and winter months that are hard on the skin, can make all the difference for preventing eczema in babies. A common myth is that you shouldn’t bathe children with eczema. However, clean skin is less prone to infections and other germs. Keep baths short (less than five minutes) using lukewarm water and a gentle, ph-balanced soap like Pibu’s™ Bathtime Wash.
Eczema is all about dry skin, so preventing eczema in babies starts with moisturizing because moisture is critical to protecting the skin barrier. After bath time, pat your baby dry to reserve some of the water and then moisturize head to toe. 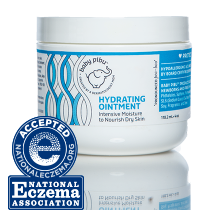 Pibu’s™ Hydrating Ointment, a natural eczema cream, fragrance-free, intensive moisturizer is perfect for locking in moisture after a bath. Repeat in the morning as well, using a lubricant like the Hydrating Ointment that can help with baby eczema treatment. If you start to see signs of dryness or irritation, switch from a cream to an ointment, which has the highest percentage of oil in the formula. You can also start to moisturize your baby a couple of times a day. The pH of the skin is actually an acid ranging from 4.5 to 5.5 in pH. pH-balanced cleansers tend to strip less natural oils from the skin, which means the skin stays more hydrated. Since the skin is acidic, sometimes you will see citric acid listed as an ingredient in some cleansers. pH-balanced cleansers make you feel less “squeaky-clean” because there are fewer oils taken away from the skin. Baby Pibu’s 2-in-1 Tear-Free Wash is pH balanced. If he or she is prone to eczema flares, this is a must for preventing eczema in babies! During the winter when it is cold and you’re heating the house, the air tends to get dryer as it gets heated up, <5% humidity. This dryness pulls out the moisture from your skin. During the summer, it can be >25% humid in our homes. Cool humidifiers are preferred to prevent any scalding hazards in a baby or child’s room. By now you know you should apply a moisturizer to your baby’s skin each time she has a bath. When you notice her skin is irritated and red, begin applying a moisturizer at other times during the day for baby eczema treatment. The more moisture you can provide her skin, the better. Ointments are a mixture of 80% oil and 20% water as opposed to lotions, which are 20% oil and 80% water. Ointments simply do a better job moisturizing skin than lotions. Making the switch to an ointment-based moisturizer a few times a day can be all your baby’s skin needs for baby eczema treatment. Baby Pibu’s Hydrating Ointment provides deep moisture for irritated, sensitive skin. Over-the-counter (OTC) hydrocortisone creams work by being anti-inflammatory so they can help to relieve rashes. At the first sign of an eczema flare, you can apply an OTC 1% hydrocortisone cream two to three times a day for a few days to soothe the redness and irritation. However, it is important to note that hydrocortisone is intended for use in children over the age of 2. It can be used safely in babies when used in small amounts and for short periods of time. Baby Pibu™ recommends that parents contact a physician before using hydrocortisone on your baby. As a rule of thumb, if you are using hydrocortisone for baby eczema treatment and there is no significant improvement after 3 days, you should contact your physician for further guidance. Also, if you are using hydrocortisone every week, you could be developing a chronic use of hydrocortisone and you should contact your physician. Contrary to what you might think, water actually dries out the skin by pulling the skin’s natural moisture out. So, keep baby bathtime to less than 5 minutes in a lukewarm bath during an eczema flare. What features should be recognized or avoided in a cream or ointment for baby eczema treatment? Choose fragrance-free! Avoid fragrance! A fragrance is one of the most common causes of allergic contact dermatitis and can act as an irritant to eczematous skin. If you need a scent, choose a product with a low sensitizing essential oil like lavender, rosemary or thyme. Avoid these ingredients: parabens, phthalates, sulfates, formaldehyde-releasers, sodium lauryl sulfate (SLS), dyes, and bisphenol-A. They can be sensitizers and irritants to the skin. Look for the Seal of Acceptance by the National Eczema Association (NEA). A product with this seal provides confidence that the product is one that can be used on all skin types including sensitive, eczema prone skin. Furthermore, this seal can provide you confidence that the product has been clinically tested to be irritant-free and hypoallergenic. The NEA also provides guidelines to how a product meets their Seal of Acceptance and provides nuances in products that you should be cautious about. Warnings: For external use only. Avoid contact with eyes. Stop use of the natural eczema cream and ask your doctor if condition worsens or symptoms persist for more than seven days. Do not use on puncture wounds, animal bites or serious burns. Doctor’s Instructions: Apply to severely dry, inflamed and eczema-affected areas no more than three times per day. Do not use natural eczema cream for diaper rash. For treatment of infant, toddler, and childhood eczema.